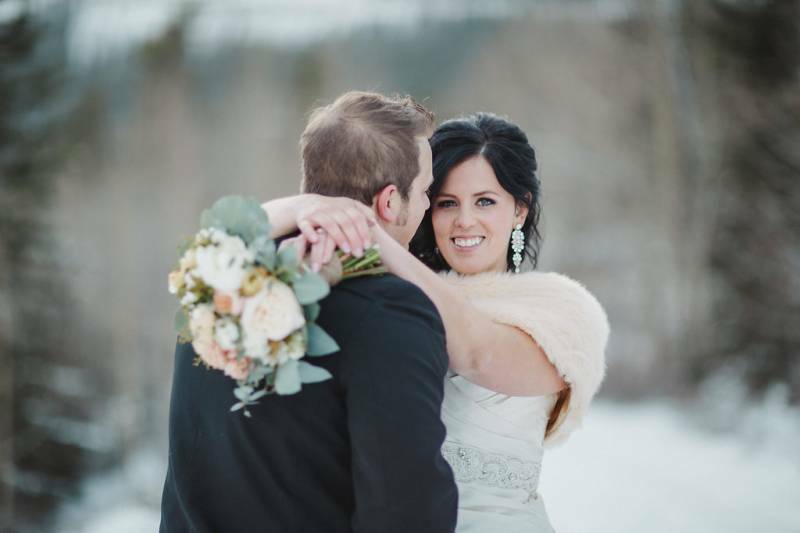 Amanda and Chris grew up outside of Calgary, loving the outdoors and all things Western, so when it came time to plan their beautiful mountain wedding they knew they had to incorporate their Western style and heritage somehow. 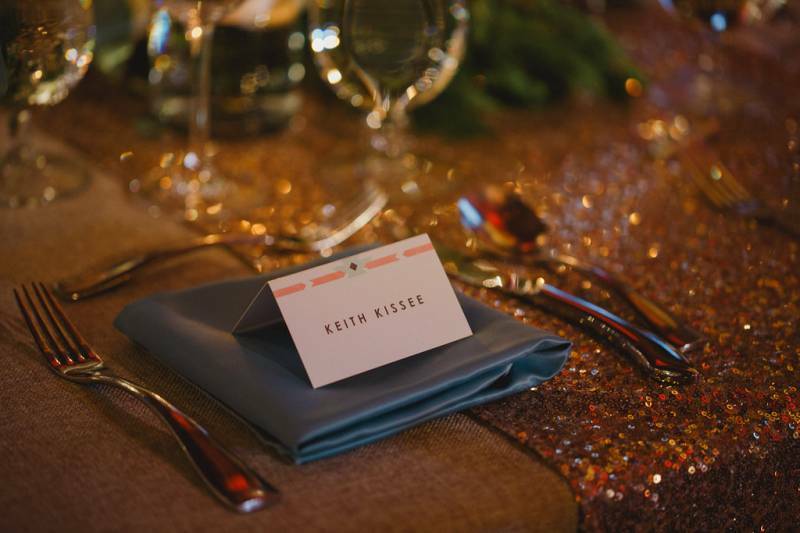 Not entirely sure how to host a glamorous and elegant event yet still incorporate their Western style, the couple worked with Julianne, the talented wedding planner from Julianne Young Weddings to help create their dream wedding. Chris wanted to see bold, masculine touches in the wedding style while his beautiful bride loved things like peonies, spray roses and gold. Although the two sounded completely opposite, Julianne knew exactly how to bring all of these opposing elements together with perfect cohesion and absolute elegance. 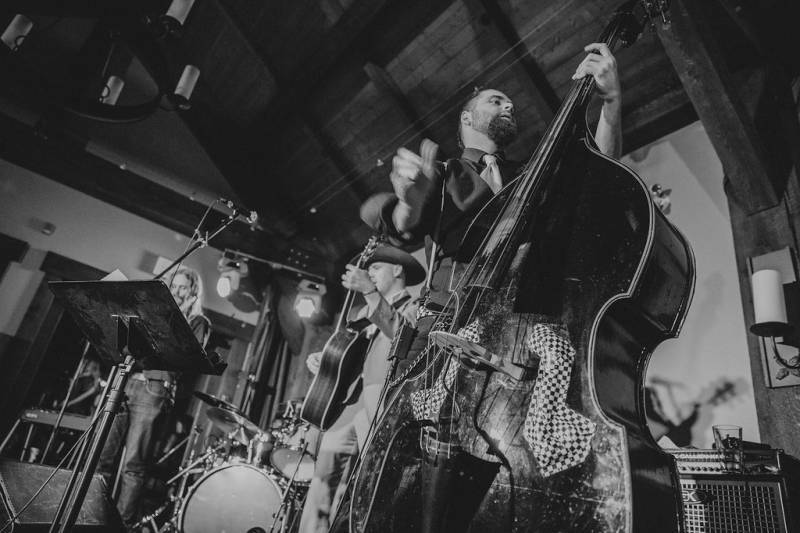 Firstly, the wedding was set to be held at the elegant Silvertip Golf Course & Resort which has it's own rustic but luxurious feel to the pavillion. 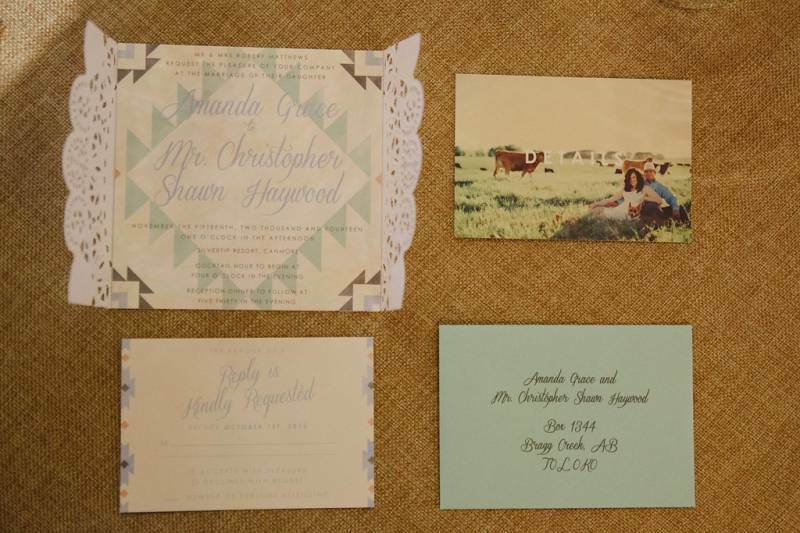 Next, Julianne created a beautiful colour palette of peach, powder blue, sage and ivory that was elegant but not too feminine. 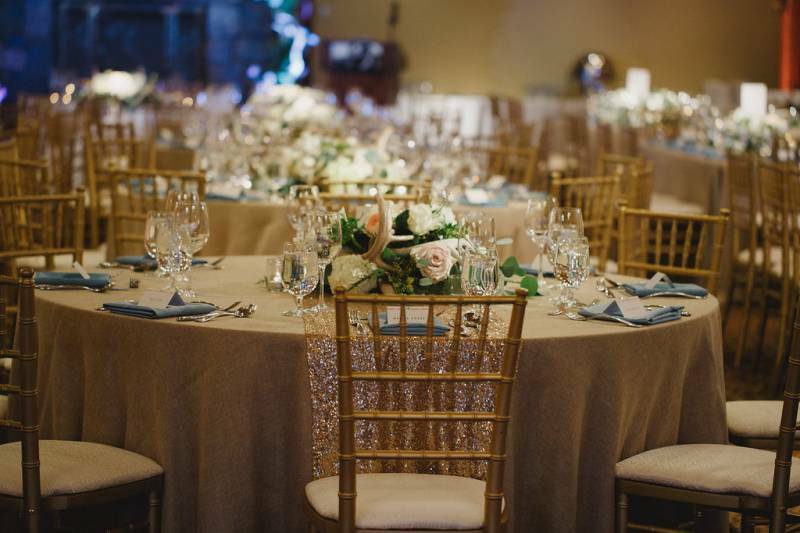 Working with this palette she designed beautiful tablescapes and added gorgeous glittering gold linens and gold chiavari chairs to the design. 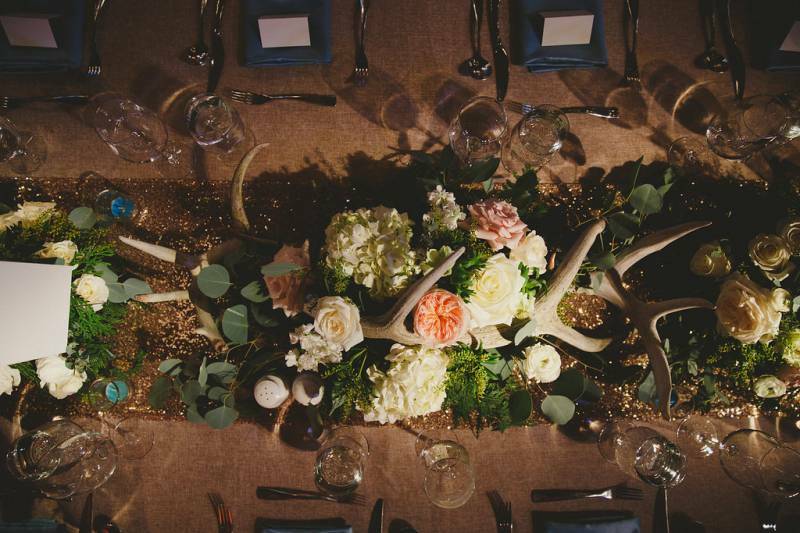 Then elements like deer, moose and elk antlers, a navajo pattern and textured greenery were added for the masculine and Western touches. 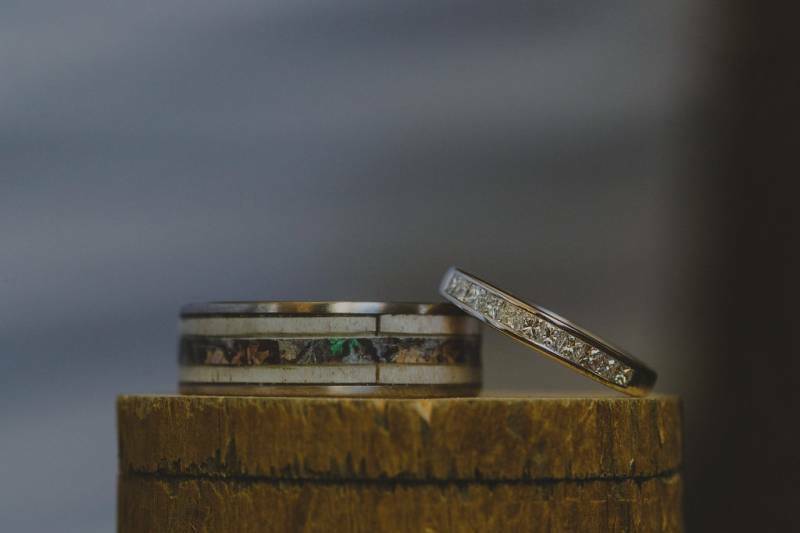 The results were the perfect balance of Western glamour and the day was absolutely stunning, ending with a beautiful new marriage and the happiest couple you've ever seen! 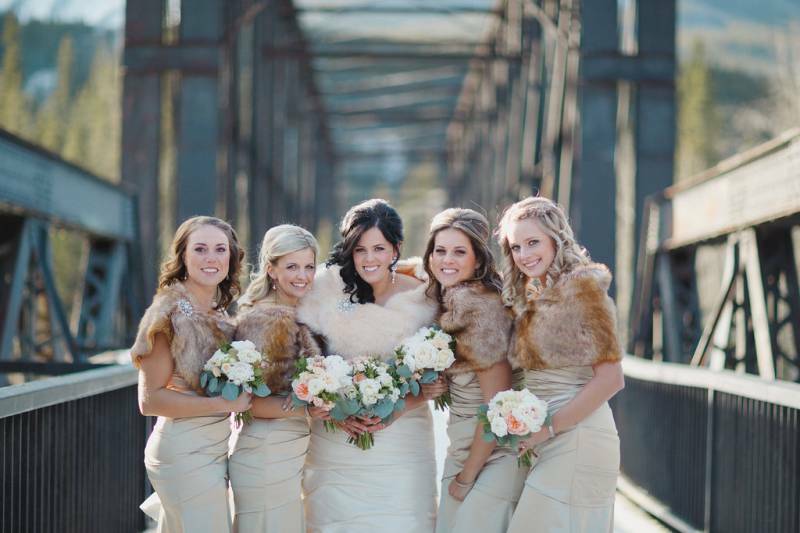 A huge thanks to Julianne Young Weddings and Loree Photography for sharing this beautiful day with us. 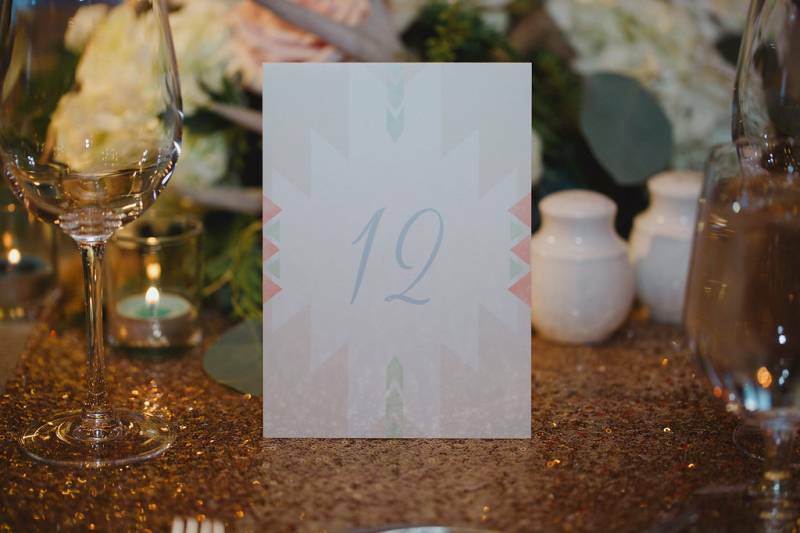 Bloom Invites created a beautiful custom invitation suite for Amanda and Chris that included a nodd to their Western style through a subtle navajo pattern, the same pattern was used throughout the table numbers and stationery elements at the reception as well. 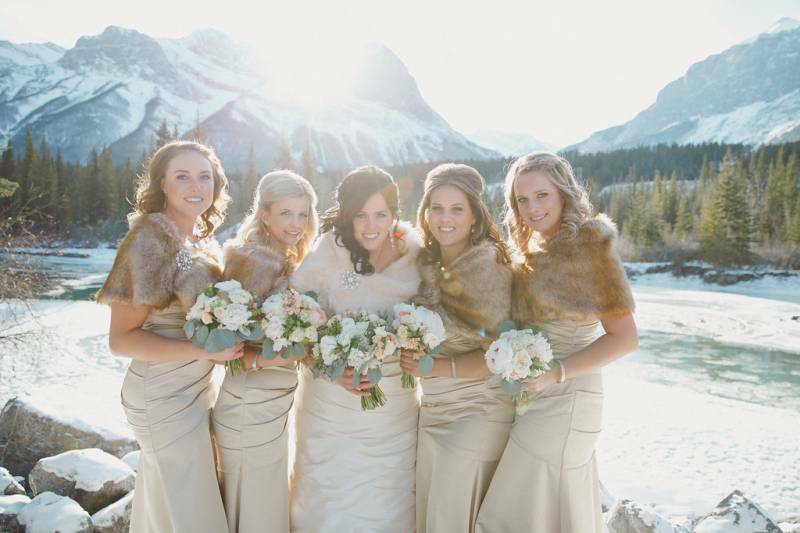 The bride and her bridesmaids wore matching fur stolls in white and champagne, while the groomsmen dressed in a western formal style. Amborella Floral Studio designed all of the flowers including the beautiful bouquets carried by the bride and her bridesmaids. 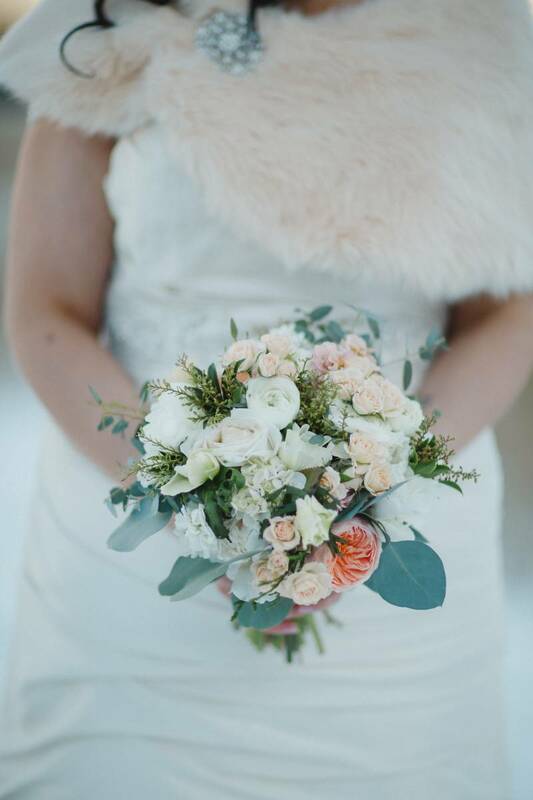 The bouquet incorporated the colour palette of peach, powder blue, sage and ivory and incredible elements of texture to give it more dimension. 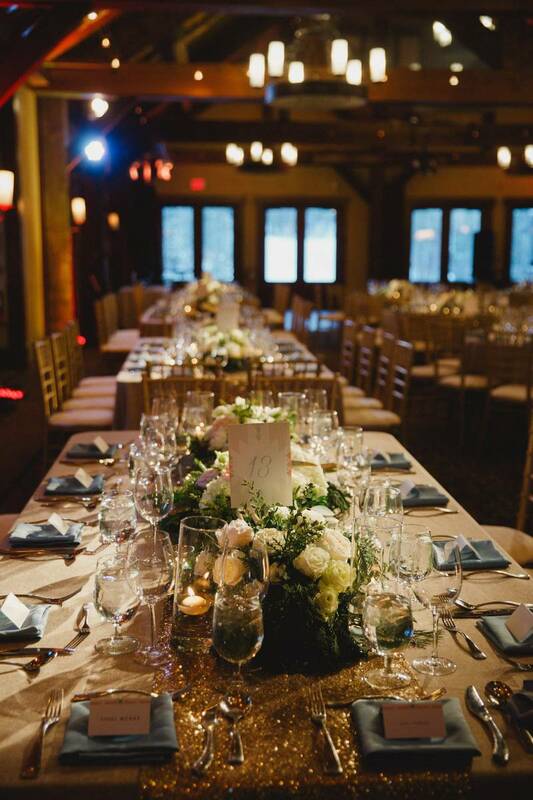 As guests entered the Canmore wedding reception, they walked through a hallway of 9ft tall trees and soft amber lighting to enter the reception room. 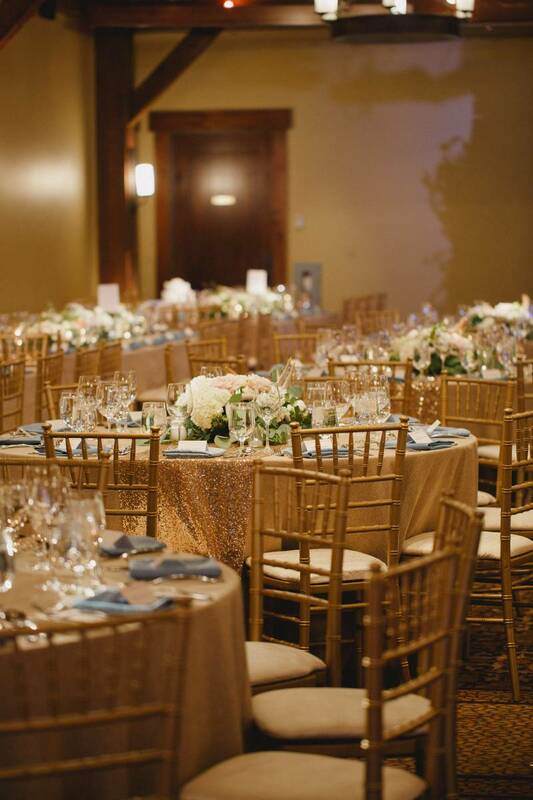 The wedding reception was nothing short of dazzling and everything Amanda and Chris had ever dreamed about! 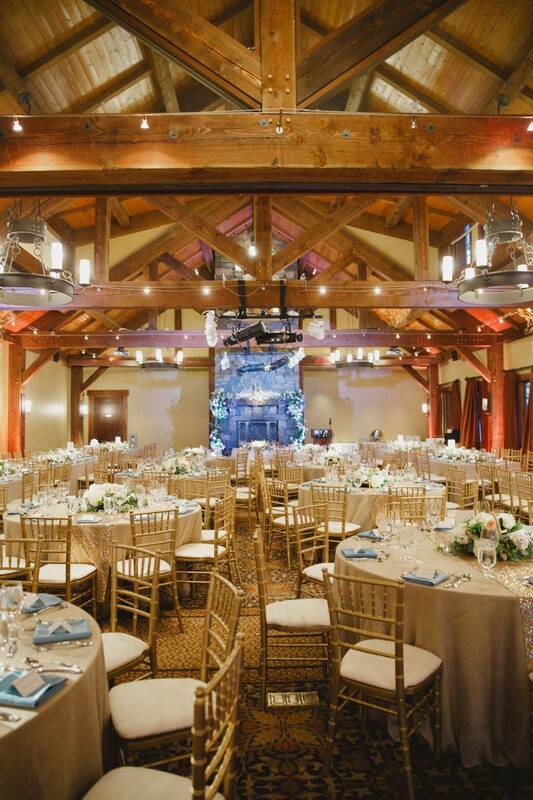 The lighting (Stardust Event Group) was a key element of the night, as the same lace pattern from the ceremony aisle was projected up into the tall wooden beams of the ceiling and soft amber up-lighting created a warm and cozy environment. 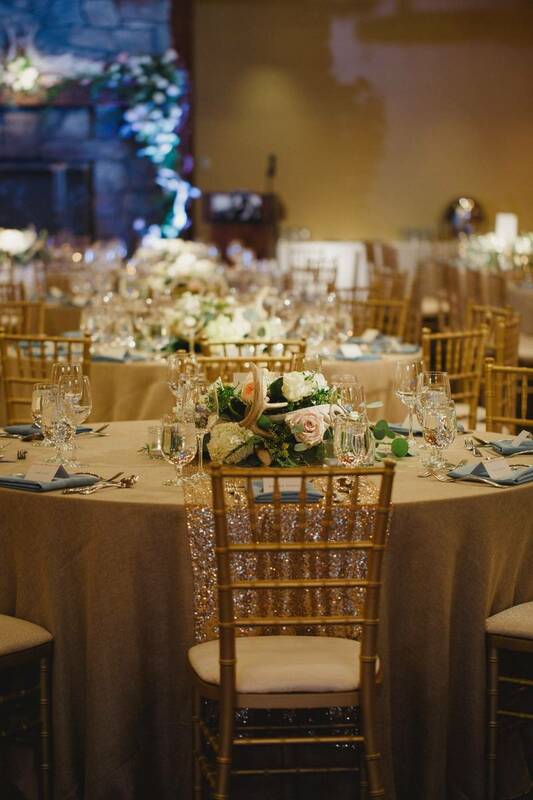 There were a mixture of rectangle and round tables along the venue, and a romantic sweetheart table for the bride and groom. 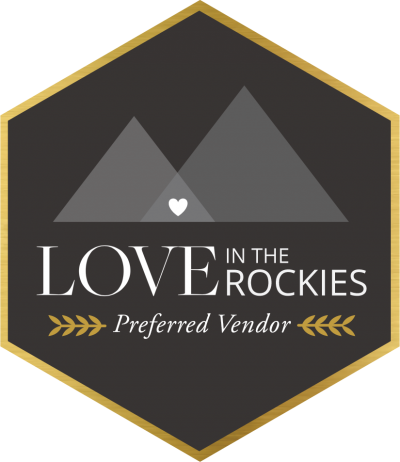 All of the gorgeous rentals are from Special Event Rentals and Red Events Design and all those amazing linens are from Celebration Creation. 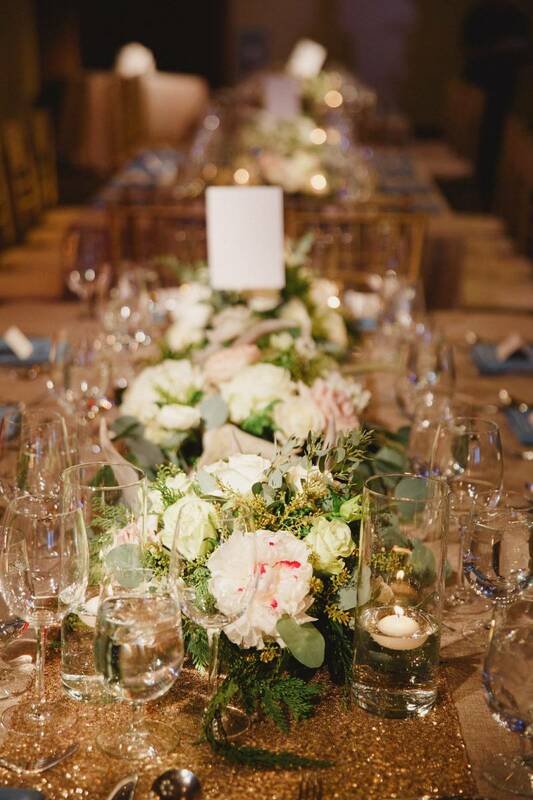 We really can't get over the incredible centrepieces and tablescape created by Julianne and this amazing team of wedding vendors! 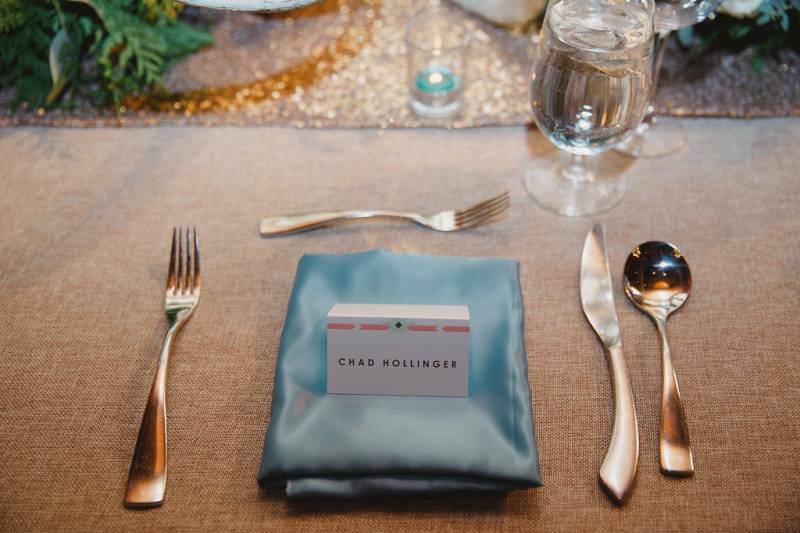 Glittery gold linens that would make the girliest of girls happy mixed together with antlers, roses, hydrangeas, peonies and incredible foliage - it really is the perfect mix of rustic and glamour. 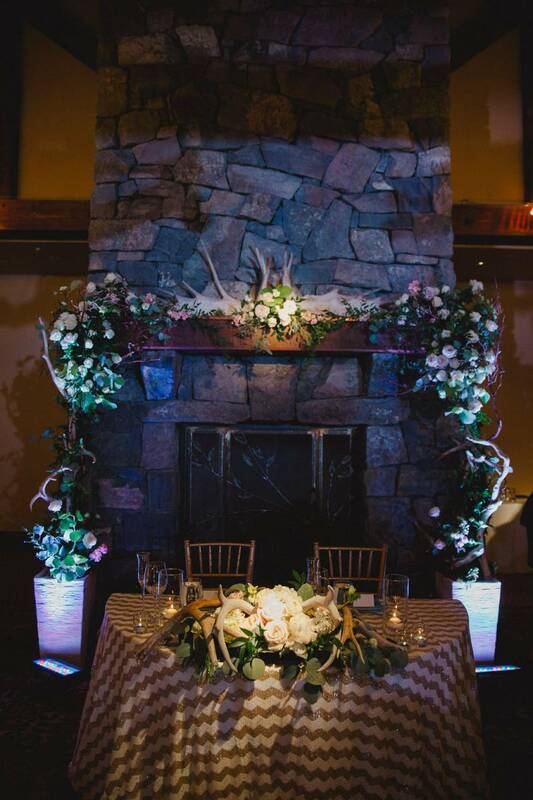 Oh and did we mention the antlers were all from the groom's personal collection!